I know that sound. That's a bad sound. : Bikes. Rants. Adventures. I know that sound. That's a bad sound. Hopping on my bike to head home yesterday, there was an immediate "uh oh" feeling emanating from the bottom bracket. After gingerly riding to the train station, I accessed the damage: crank was fine, belt was fine, pedals were dandy - but there was play in my bottom bracket axle. It was hard to feel, but it was definitely there and definitely the source of the lovely song that my BB had been singing during my afternoon ride. Once I was back in my shop, I was able to do a better test to determine it was the axle. The BB is the only thing that remains stock on the Trek at this point, and since I don't know much about its history I can only imagine how many miles it has on it. I also suspect my recent intermittent sprints during my commute probably didn't help, and a rather intense sprint that I did on my last stretch of road before pulling into work yesterday morning is probably what did it in. 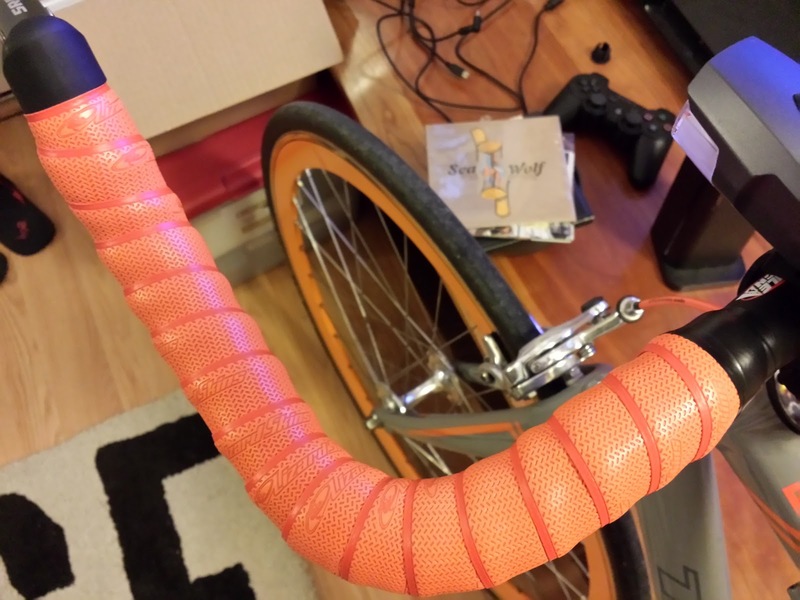 I didn't have a spare BB to install, and every shop was closed at this point, so all I could do was angrily wrap my bars with some new Lizard Skin tape. After waking up, I located a new BB - 68mm shell, with a 113mm axle, to be precise, and set to work. Beautiful day today...if I can't ride outside, might as well work outside! Replacing a bottom bracket is pretty easy once you know how to do it and have the proper tools. I have a great story of being at the coalition and having to use the Sheldon Brown method with eight people to remove a cup, so I can see how it's a bit daunting to some. This one turned out to be no problem. I pulled the crank and checked the axle again - there was definitely play, so I knew I wasn't just going to be swapping the BB for nothing. I pulled the old BB, a cartridge bearing plain looking thing, and cross checked it with the Shimano UN-55 I had picked up earlier. Same measurements - good to go. Brand new and ready for lots of mileage! These two thankfully used the same tool for installation and removal, so I didn't have to buy another one. One of the many types of Shimano BB tools. Everything got cleaned and regreased, and installation was easy. Anyone wondering, the belt just kind of hangs out when I pull the crank. Once the crank is back on, I rechecked tension and chainline. Since there was some play in the previous BB, I wanted to make sure my alignments were still correct, or that the new BB didn't throw off the chainline. The belt tension felt a bit high, so I adjusted it down a bit. It's the same as tensioning a chain, just a slightly different dropout design on this particular District. There are a few areas that can be tweaked to adjust tension. The dropouts themselves have to be loose, and then the tension bolts are tightened or loosened. After a few minutes and only getting my finger almost chopped off by the belt once (if it were a chain, I probably would be missing a thumb right now) everything was good to go. I'll test later to ensure everything is playing nicely together, but right now I want a smoothie. The whole process maybe took thirty minutes. I think the most time consuming thing was cleaning the grease off my hands to take photos!